"It was supposed to be a whole new era, as celebrations accompanied the adoption of civil union and domestic partnership laws in several states. 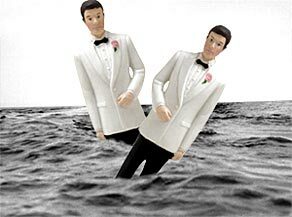 But a funny thing happened on the way to the altar: Gay couples decided they might not want to get married after all... 'For many of us, the idea of getting married sticks in your craw. Why would anyone want to get married? It's almost a visceral reaction.'"